Home/Posts/How to verify your Backups? How to verify your Backups? Everyone has some data that they can’t afford to lose. That’s why backing up the data has become indispensable. Today, almost every business has understood the importance of backups, and are performing backups regularly. While we look for proper scheduling that helps us with compliance laws and retention options to hit the right backup strategy for our organization, we miss one simple, but very important thing – Verifying whether our backups are recoverable. Backing up the data is not the end goal by itself. We need to be able to restore the data when we need it. At that crucial moment when every minute counts, what if an error is thrown that says your backups are not recoverable? You might think if you have backups, your data is safe and you can access at any time. But there is a high chance of your backups getting corrupted and becoming worthless. You may not realize this until there comes a time to perform the recovery of your backup data. Though you have backups, you will be left with nothing at that time. This is why verifying the recoverability of your backups matters. However, manually verifying your backups everytime is not a feasible process. You need to set up automated verification. With this, you can rest assured that you are going to get your data back in the way it was before. To achieve this, you need to implement a backup solution that offers backup verification feature. 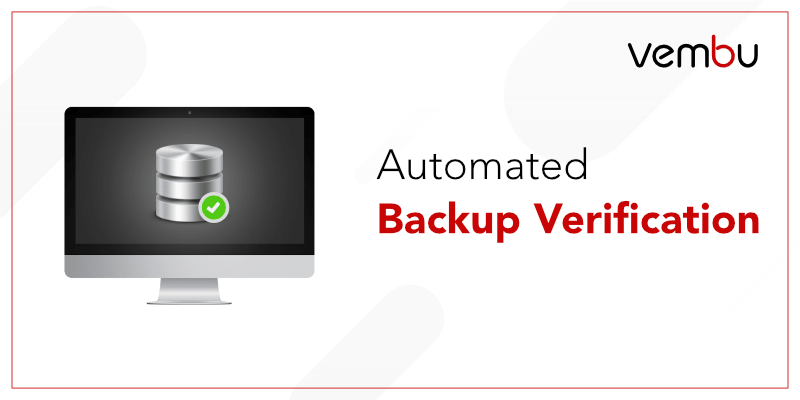 Vembu is one such solution that understands the importance of verified backups and offers 3 tier backup verification check. The three-tier backup verification process consists of mount test, boot test, and integrity test. With these tests, Vembu ensures the recoverability of the backup data. How Automatic Backup Verification of Vembu works? The backup verification process is carried out in the Vembu BDR backup server. The image-level backups of VMware VMs, Hyper-V VMs and Physical Windows machines undergo the 3-tier verification test. To enable the boot check verification process, BDR backup server should be installed on the physical machine. Once everything is properly set up, the automated verification process will be triggered once every day or after completing each backup schedule. To check the recoverability of the backed up physical & virtual machines, the backup data is mounted from the backup storage targets on Hyper-V or KVM and booted as a VM. The screenshot of the boot screen is captured. You can view the Image Integrity Reports from the BDR server console or choose to receive email notifications with the obtained screenshot. This process verifies the bootability of the OS disk. This process is carried out to ensure whether the backup disks are mountable. The backed up disks are temporarily mounted on the BDR server’s Disk Management and its mount-ability is verified. This test validates the consistency of your backup data. This provides the ability to recover the data to its original state with 100% accuracy. With these tests, Vembu verifies your backups within few minutes and ensures the data backed up are recoverable. This helps you save the time involved in manual verification. Also, you can be sure that you can bring back all your data and be less worried about the recoverability in case of disaster. You know that you need to protect your data. And you know the importance of verifying your backups. Test them regularly and be assured that your data remains restorable.